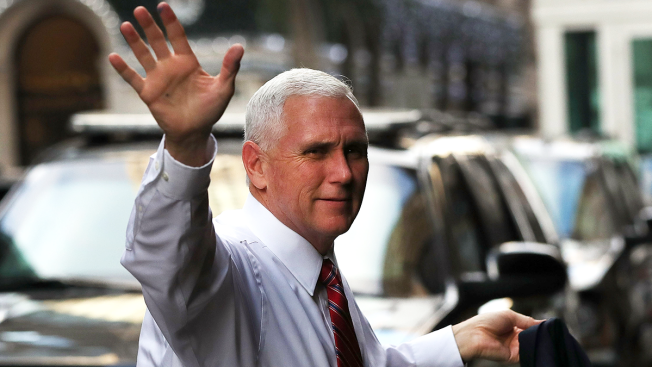 Vice President-elect Mike Pence's appearance at a Republican fundraiser in downtown Chicago drew about 150 protesters who chanted "Mike Pence go away!" The Indiana governor spoke at a luncheon Friday. Protesters from several groups gathered outside. Tickets for the fund-raiser started at $2,700 per person. According to a Pence aide the vice president-elect raised about $1 million for the Republican National Committee. Among the members of the host committee were Illinois Gov. Bruce Rauner, state GOP chairman Tim Schneider and Republican members of Illinois' congressional delegation. Photos of the event posted Friday on Pence's Twitter account show about 70 people at The Chicago Club. The tweet says, "Appreciate the encouragement & support of many Chicago business and community leaders of the inauguration of President @realDonaldTrump."